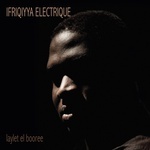 Fusing the rhythms and invocations of the ancient Saharan Banga ritual with an electrical storm of contemporary sonics, Ifriqiyya Electrique's second album both grips and awakens. In Tunisian, Banga means "huge volume" and one cannot think of a more apt description of Laylet El Booree than that: Maximalist and relentless; Blood, sweat, and trance. Several years ago, two of the musicians who make up the five-piece Ifriqiyya Electrique -- Gianna Greco and François R. Cambuzat -- ventured to the Djerid desert of Tunisia to investigate and confront the religious ritual of the Banga, a ritual of legendary intensity indigenous to the region. The musical duo's background is in the underground post-punk scene of continental Europe, as members of Putan Club and as collaborators with the venerable Lydia Lunch. But they are also voracious travelers and seekers of global sonics that are at least partially hidden from the western gaze. 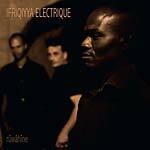 In 2017, Ifriqiyya Electrique released their debut album Rûwâhîne (GB 046CD/LP), an album which deftly brought together the hypnotic chants and metallic hand percussion of traditional Banga music with brutalist electronics and sheer rock volume. Three members of the Banga community -- Tarek Sultan, Yahia Chouchen, and Youssef Ghazala -- joined forces with Gianna and Francois not only on this acclaimed album, but also onstage throughout the eighteen months of touring that followed the record's release. It quickly became clear that the Banga had not been pointlessly retooled for western consumption, but rather through the deep commitment of the five Ifriqiyya Electrique musicians -- it had been transformed into something contemporary and unexpected. Ifriqiyya Electrique cryptically call this transformation a "post-industrial ritual" and the actual experience of hearing this music certainly echoes this moniker. The title of the second album Laylet El Booree translates as the "Night Of The Madness". It refers to the last part of the annual gathering of the adorcist ritual from the Banga of Tozeur -- it is the night when the spirits actually take possession of the bodies. With the band now joined by new member Fatma Chebbi (on vocals and tchektchekas hand percussion) one senses that the musical and cultural conversation is even deeper this time around. In fact, it doesn't feel like a speculative conversation at all, but rather something fully formed and undeniable. An emergent ritual in itself. Sufi trance musicians and rituals -- from the depths of the Tunisian desert -- in conversation with post-industrial sonics. Ifriqiyya Electrique's François Cambuzat -- a guitarist and field recordist (Turkey, China, Central Asia) -- is a veteran of the Mediterranean punk and avant-rock scene, which has always been more politically charged than its counterparts to the north and (far) west. With bassist Gianna Greco, he is half of Putan Club (and one third when these two fierce and uncompromising players are joined by legend of the NY underground, Lydia Lunch). Ifriqiyya Electrique was formed in the Djerid desert in southern Tunisia. The Banga is a key annual event in the lives of the black communities of the oasis towns of southern Tunisia, descendants of the Hausa slaves transported from sub-Saharan Africa. It is a ritual of adorcism, not of exorcism; of accommodating the possessing spirit rather than expelling it. The invitation has been issued by the rûwâhîne themselves, the spirits from whom the record borrows its title, and is taken up primarily in the streets and in private houses. The Banga is a musical tradition, with stark, metallic, cavernous percussion, and voices of cool urgency, but should not be felt as such, for it is most defiantly a ritual and remains so on this recording. Cambuzat and Greco are joined in live performance by the voices, krakebs, and Tunisian tablas of three members of the Banga community, Tarek Sultan, Yahia Chouchen, and Youssef Ghazala, with a fourth, Ali Chouchen, providing vocals and nagharat on the recording itself. The voices and rhythms are unaltered, of course. What is new here is the conversation the group initiates between guitar, bass, and electronics and the rhythms and chants of the Banga -- what Cambuzat refers to a post-industrial ceremony. It won't be an easy listen for purists and propagandists; but if post-industrial ceremony doesn't describe a large portion of the most challenging music of the last 40 years, what does? In short, the music can only be fully understood in the context of the events that gave rise to it. 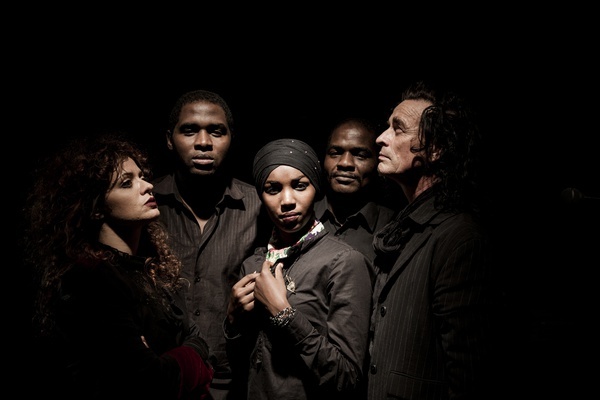 Happily, Ifriqiyya Electrique is a film and documentary project as much as a band. The footage is astonishing: of wild, ecstatic gatherings that seem, to the un-initiates, by turns other-worldly and utterly familiar. It is familiar because of the need for "new ways of forgetting," in Cambuzat's words. But surely there is a need to remember too. For here is another deep tradition, another precarious music, on the brink: a vital part of a Sufi culture being pressed on all sides by the forces of reaction. Ifriqiyya Electrique will not be lamenting its passing -- because they will refuse to let it pass. LP version. 180 gram vinyl. Includes download code. Sufi trance musicians and rituals -- from the depths of the Tunisian desert -- in conversation with post-industrial sonics. Ifriqiyya Electrique's François Cambuzat -- a guitarist and field recordist (Turkey, China, Central Asia) -- is a veteran of the Mediterranean punk and avant-rock scene, which has always been more politically charged than its counterparts to the north and (far) west. With bassist Gianna Greco, he is half of Putan Club (and one third when these two fierce and uncompromising players are joined by legend of the NY underground, Lydia Lunch). Ifriqiyya Electrique was formed in the Djerid desert in southern Tunisia. The Banga is a key annual event in the lives of the black communities of the oasis towns of southern Tunisia, descendants of the Hausa slaves transported from sub-Saharan Africa. It is a ritual of adorcism, not of exorcism; of accommodating the possessing spirit rather than expelling it. The invitation has been issued by the rûwâhîne themselves, the spirits from whom the record borrows its title, and is taken up primarily in the streets and in private houses. The Banga is a musical tradition, with stark, metallic, cavernous percussion, and voices of cool urgency, but should not be felt as such, for it is most defiantly a ritual and remains so on this recording. Cambuzat and Greco are joined in live performance by the voices, krakebs, and Tunisian tablas of three members of the Banga community, Tarek Sultan, Yahia Chouchen, and Youssef Ghazala, with a fourth, Ali Chouchen, providing vocals and nagharat on the recording itself. The voices and rhythms are unaltered, of course. What is new here is the conversation the group initiates between guitar, bass, and electronics and the rhythms and chants of the Banga -- what Cambuzat refers to a post-industrial ceremony. It won't be an easy listen for purists and propagandists; but if post-industrial ceremony doesn't describe a large portion of the most challenging music of the last 40 years, what does? In short, the music can only be fully understood in the context of the events that gave rise to it. Happily, Ifriqiyya Electrique is a film and documentary project as much as a band. The footage is astonishing: of wild, ecstatic gatherings that seem, to the un-initiates, by turns other-worldly and utterly familiar. It is familiar because of the need for "new ways of forgetting," in Cambuzat's words. But surely there is a need to remember too. For here is another deep tradition, another precarious music, on the brink: a vital part of a Sufi culture being pressed on all sides by the forces of reaction. Ifriqiyya Electrique will not be lamenting its passing -- because they will refuse to let it pass.